Stemming from an 11-year DFID funded programme under its Renewable Natural Resources Research Strategy (RNRRS), Technology Development Assistance for Agriculture: Putting Research into Low Income Countries reviews part of this programme as a case study of a broader issue of technology development for Africa. Controversially, it critiques current international technology development assistance and focuses on the potential role of the private sector in agricultural technology development as well as providing insights for future cognate science policy and practice. The book focuses on the RIU "Best Bets" Africa sub-programme. This identified promising proposals to take existing agriculture research products and put these into use in ways that would benefit the poor in developing countries. The sum set aside for this was £5 million. The empirical sections of the book cover project selection, progress and programme management over a 2009-2012 period with special attention paid to lessons learned that may have implications for future cognate technology development assistance. 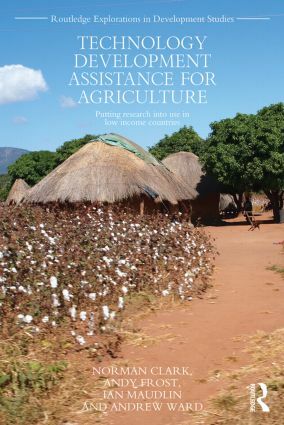 This topical book gives direct evidence of meeting objectives and delivering real changes in technology development for Africa to postgraduate students, researchers, international bodies, NGOs, policy makers and government organisations working on natural resource management, technology development assistance, and low income country agriculture.